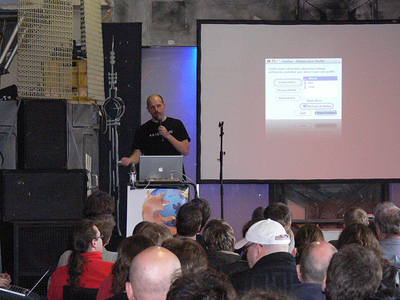 At the end of 2008 I had started learning to code extensions for Firefox, and in March 2009 I went to Berlin to give my first international presentation at an add-ons workshop. It was amazing! The rush of being on stage, teaching people, learning from them; helping, discussing and having a great time! I really loved it and at that time I felt like I had found home, what I was supposed to work with. The following years I was part of the Mozilla community, speaking at more workshops and attending MozCamps. In 2011, a position came up as a Technical Evangelist and I joined Mozilla full time. Since I started I’ve gotten to meet numerous fantastic and inspiring people, both employees and people in the great Mozilla community. I’ve traveled extensively and became the Most well-travelled speaker on Lanyrd – now the count is up to 32 countries. I’ve also written more in detail about Why I travel and about working with developer relations and Why I Do What I Do. There’s also lots more in the Travel category. I’ve worked on a lot of things at Mozilla over the years, and a couple of the things I’m really proud of is having run the Mozilla Hacks blog over the last two years, and having published 350 quality posts in 2 years! I also took the initiative to launch feedback channels around the Firefox Developer Tools and Open Web Apps and we’ve gotten great feedback from developers there. Alas, it’s time to move on. I’ve always preached to developers to always strive for more, whether that’s a new position in the current company or changing jobs, to ensure they keep on evolving and don’t stagnate. And I feel I really have to follow my own example in this regard. I’ve gotten to learn and experience a lot of things at Mozilla and for that I’m eternally grateful. Mozilla is going through a number of challenges at the moment, and to be honest, it’s my belief that the upper management need to acknowledge and address these. I believe Mozilla is representing a great cause and I wish they can fix and tend to what they’re facing and that they come out stronger. 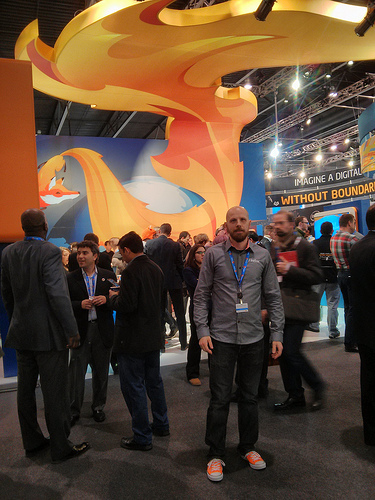 I believe the Open Web and people need Mozilla and I wish it, and all the great people I know there, all the best. I will be starting a new job, and I’ll tell you about it tomorrow, Thursday. For now, I’ll just let this sink in and then I’ll talk more about it. If you have any questions or thoughts, please let me know here in the comments or e-mail me at robert [at] robertnyman [dot] com. I’m always here for you. Thanks for reading. Very best wishes in whatever is next. Let’s catch up in Stockholm soon. Pretty pleased to see my pic in here. I had no idea that was your first international talk in Berlin – you were very accomplished. > Mozilla is going through a number of challenges at the moment (…) upper management need to acknowledge and address these. Anyway, wish you the best for what’s next! I think that’s up to Mozilla to deal with internally, and not in the public. good luck in you next adventure! Thank you very much, Jan, and thanks for all your work on Firebug! I think I can safely say, on behalf of the web community, thank you, Robert. You’ve been an inspiration long before you joined Mozilla, but the work you did there amplified your importance to the community and industry. That work, will remain long after this day, when you leave Mozilla. Thank you and godspeed, wherever path you chose to go down next. Cheers and best wishes from Portugal. Thank you so much, André, that means a lot! Known you for so many years now! I’m sad to see you go. I loved getting to see you at Mozilla & MDN events, and you’ve done great work on Hacks for years! Thanks Luke! Great working with you, and I’m sure our paths will cross again! I’m going to miss seeing you around Summits, MozCamps, FOSDEM, etc. When we first met in 2011 in Berlin, it was my first real introduction to Mozilla. You were one of the first people outside of the localization team to make me feel at home here. Thank you for that, and for all of the chats about Sweden. When I’m in Stockholm again, I’ll be sure to be in touch. Thank you Jeff, makes me so happy to hear that! Any day, my friend, and you and your family are more than welcome to visit in Sweden any time! Good luck, Robert. You’ve been inspiring. I’m sure you’ll continue to do that in your next role. Since I’ve known you you have been one of my favorite people at Mozilla–your work has always been excellent and you will be missed. Bon chance. Bill, thank you very much! Much appreciated! Robert, good luck and the best, you deserve. Sorry I’m going to miss meeting you in Portland; I wish you the best of luck as you move forward! Thank you! And yes, too bad – we’ll need to make up for it another time! I learnt a lot of things reading you post.. Thank you and good luck! Mozilla Hack won’t be the same without you! Thank you! And I hope they will continue to run it with more great articles! Good luck for your next job Robert ! Absolutely, Sweden’s a great place! Mozilla has lost something special. You were one of my favourite parts of working there and I was so happy to see you stay there and continue fighting the good fight. It makes me sad to see that you’ve also decided to leave, though I’m happy that you’ve made a decision and can move onto the next challenge in life. We’ll have that long overdue catch-up soon. Looks like we might need a few days! Hey Rob! Thank you so much! And absolutely, we need to make sure to catch up soon! We’ll miss your well written articles. Good luck in your next adventure my friend! Thank you, Gloria, and keep up your great work! It was amazing collabrating with you on many occassions. Best wishes for your new endeavours. P.S. : I wonder what happens to https://hacks.mozilla.org/ now. I hope they will continue to run the blog and have great articles. Best of luck, Mr. Nyman! I am sorry I still haven’t been able to meet you at any conference. Hopefully your new job will leave you the opportunity to attend them. Mozilla Hacks will look weird with out you. It is one of my favorite places on the web. I wish you success and happiness in this new chapter of your life’s journey. Thank you for all the great work. Thank you for helping a lot of people, me included, get better. Thank you very much, Dejan! And absolutely, I hope we can meet somewhere in the future! I hope Mozilla will continue to run Hacks, would be nice to see that legacy kept alive. Wow, sorry to see you leaving us… I don’t think many people truly recognize how much good you have done for the web. Awesome work… you will be missed! Thank you so much, Mike! It really means a lot to me!